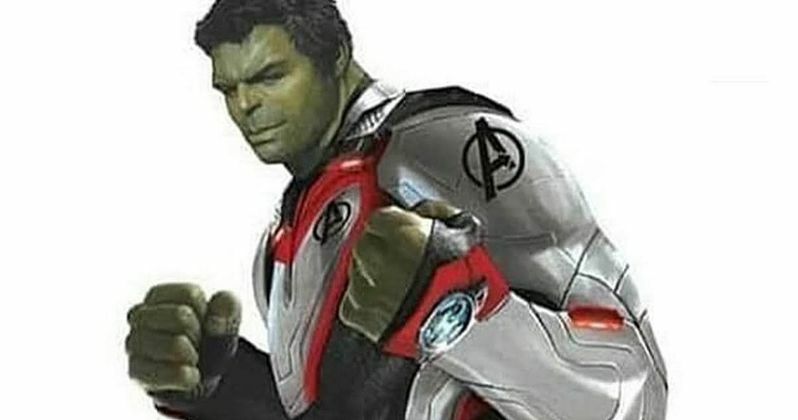 Avengers 4 Art Shows New Quantum Realm Suits, Is It Real or Fake? Avengers 4 is without a doubt the most anticipated movie of 2019, and that's even with a new Star Wars movie on the way. Marvel and Disney have revealed precious little about the movie, though a constant stream of leaks, rumors and theories continues to dribble out of the ether. Now, we have what was originally called a leaked piece of art from the sequel, which shows the surviving superheroes in their new Quantum Realm costumes. But the art has quickly been called out as fake. There is no confirmation from Marvel or Disney about the art in question, but others on the Internet have thus far confirmed the otherwise pretty authentic looking art as fake news. Earlier promotional art, which is still assumed to be real, showed Thor and Rocket Raccoon in their new Quantum Realm suits from the sequel, and others were teased in these new costumes as well. This latest art purportedly gave us a way better look at the suits, which you can see below, but chances are high that someone made this on their computer while waiting for the next showing of Overlord. You can do great things with an iPad and a couple of extra minutes on your hands. The suits are red, white and black, and are theorized to protect the Avengers from their trip into the Quantum Realm, where Scott Lang was stranded at the end of Ant-Man and the Wasp. The images feature most of the remaining heroes left alive at the end of Infinity War, including Iron Man, Captain America, Thor, Hawkeye, Rocket Raccoon, Black Widow, Ant-Man, Nebula, and Hulk. All of the suits are matching. The one problem with this scenario is that Hank Pym builds this tech, and he was last seen floating away in a pile of dust along with his daughter and wife in a post-credit scene from Ant-Man 2. So how do they get these suits? Tony Stark finds the blueprints and 3D photocopies them? Probably, if we had to make an educated guess. Similar suits were seen in recently leaked toy art, with Thor and his new friend Rocket Raccoon ready to traverse other realms of reality as they fully emerge themselves in Marvel's cosmic side. But there are some major differences between this fake art and the art in these toy images. Things don't quite line-up. The art here is a bit off, in terms of the head and body proportions. The suits shown in this new art looks pretty slick, and is eye pleasing to see the whole team in unison, ready to fix what Thanos broke. It's likely that the heroes will be getting unified armor as they set out for their final battle, which is rumored to involve time travel and confirmed to feature some exciting flashbacks. It is also confirmed that the Quantum Realm will play a huge part in the movie. In an early interview Kevin Feige said this. "At the end of Ant-Man we followed Scott Lang into the Quantum Realm for the first time," Feige said. We were beginning to peel back the onion that would later be completely peeled back in Doctor Strange as we go into the multiverse. So that was our little test into that. But now the Quantum Realm is a whole other territory that we can play with to tell our stories. This Quantum Realm is much larger than we ever imagined, and there are all sorts of adventures to be had at that level, which perhaps we will explore in another film." You can check out the art for yourself below, which blew in from Reddit. It looks pretty cool, but some are assuring that its 100% fake this morning. However this shakes out, it's still pretty cool to look at.